We are launching our new email newsletter system very shortly. 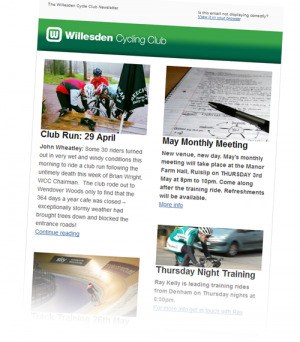 Sign up using the simple form below and receive Willesden CC news directly in your inbox. If you receive the message that your email is already subscribed to the list please don’t worry, Willesden newsletters will be sent to your email address. With the help of John Wheatley and Liz Creese I have imported as many member email addresses that we could gather. The reason that it says you are already subscribed is that we have added your email address already, result! Great to have everything all in one place. Great to see upcoming events in advance and article summaries with hyperlinks to find out more. I have to report some sad news. One of our Life members Brian Horwood died earlier this year. Brian was always ready to marshal in the Reliability Trials until his eyesight failed. Can you please tell me if Jimmy Love is still around? You may remember our previous correspondence when I told you I was apprenticed with him during the 1948 Olympics. You then put me in touch with him.